1 Bedroom, 1.5 Baths, Sleeps 2...NEW POOL IS OPEN ! The Kaanapali Beach Resort area is a 1,500 acre luxury resort which includes two championship golf courses along one and one-half miles of the world famous Kaanapali beach. Guest activities include sailing, snorkeling, hiking, golf, tennis, and plenty of relaxation! Hotels, shops, and restaurants are a short walk away, yet you are secluded in an oasis of quiet and privacy in our home at the Maui Eldorado Resort. You can easily move about the entire resort area by foot or by complimentary 'jitney shuttle' which also serves old Lahaina town, a historic whaling village. During 'whale season' (Late November to April), whales can easily be seen from our beach-front cabana, or get a close-up look on a whale watch from a sailing catamaran. This Resort has a wonderful beach cabana located oceanfront on Kaanapali Beach. It is for the private use of owners and guest. Guest staying at the Eldorado may rent the cabana in the evenings for private parties. Great for wedding receptions, anniversary or birthday parties. World famous Kaanapali Beach & our private beach cabana is just a short walk (5 minutes), or ride the bellman's cart to the cabana. Located within the Kaanapali Resort. The resort trolly-bus is free for Eldorado guests and traverses the hotel within Kaanapali. City/County bus service can be accessed at Whalers Village. The historic whaling village of Lahaina is 4 miles away. Free shuttle or paid bus service available departing Whaler's Village. With three miles of white sand and crystal clear water, Kaanapali Beach is sure to please. Enjoy the Maui Eldorado's private beach cabana with full kitchen, restrooms, tables, chaise chairs on the cabana deck, and beach chairs for the sand. Pack a lunch and enjoy a full day at the beach! Underground parking garage and surface parking available. A high speed (50Mbps) WiFi internet connection is provided in the unit free of charge. Towels and linens are provided. Self-service on washing and drying during stay. Large sofa; 2 reclining chairs for relaxed TV viewing; 2 kitchen bar stools; dining table and 4 chairs. Full electric range and oven. Our drip coffee maker uses "cone" filter if you are shopping before check-in. Some spices and condiments, but can't be guaranteed. A full compliment of dishes, glasses, flatware, pots and pans is provided. Up-to-date modern kitchen with new cabinets, soft-close doors and drawers, stainless steel appliances, and quartz countertops. Fully equipped for cooking and casual entraining. Dining table in-doors seats 4. Lanai dining table seats 4 outdoors. Flat screen TVs; LR and MBR. Some books on local area places of interest. Beach cabana has a free 'share' library…take one, leave one. Some Hawaiian CDs and tapes. Available for rent at reasonable rates in Lahaina. Spacious lanai for relaxed outdoor seating. Sun shades can be lowered for shade in afternoon. Two large pool decks near unit with chases, umbrellas, shuffle board. Our new full-size bocce ball court is open ! Rental gear is available in the Lahaina Gateway Shopping Center directly across the street from the resort. Court rentals located next door at the Royal Lahaina tennis stadium. Resort is located on the Royal Kaanapali Golf Resort. Discounted greens fees for guests. Mention you are a resort guest for discount. Shower is not wheelchair accessible, but has small bench seat inside shower stall. 3 outdoor pools on property; 1 salt water pool. 2 fresh water pools. 1 is heated. 2 fresh water & 1 salt water pool shared on property. Bellman and Concierge service available. Whaler's General Store across street with drinks, snacks, light food options. This is a Non-Smoking Condominium. Catering Available: Contact CJ at CJ's Deli adjacent to resort for full service catering or take-out. Gas grill available on Lanai. Larger shared grill available on garage pool deck. Two smaller pools near unit with chase, umbrellas, shuffle board. Outdoor furniture includes dining set and 2 chaise lounge chairs. Unit has a beautiful garden view and a partial ocean view of channel separating islands of Maui and Molakai. Unit has a partial view of 6th tee at Royal Kaanapali Golf Course. Comcast high speed cable Internet available in unit at no cost. Free WiFi available within unit and in some resort areas. Contact Front Desk. Handicapped Accessible (may have limitations): First floor unit. No steps. Unit does not have wheelchair accessible shower. I was here for an extended stay due to work and loved this unit! It was so comfortable and the extra little amenities that the Owner has in place was great. I can honestly say this was the best VRBO/Homeaway find I've had. The Owner as well as the Property staff were wonderful to work with. 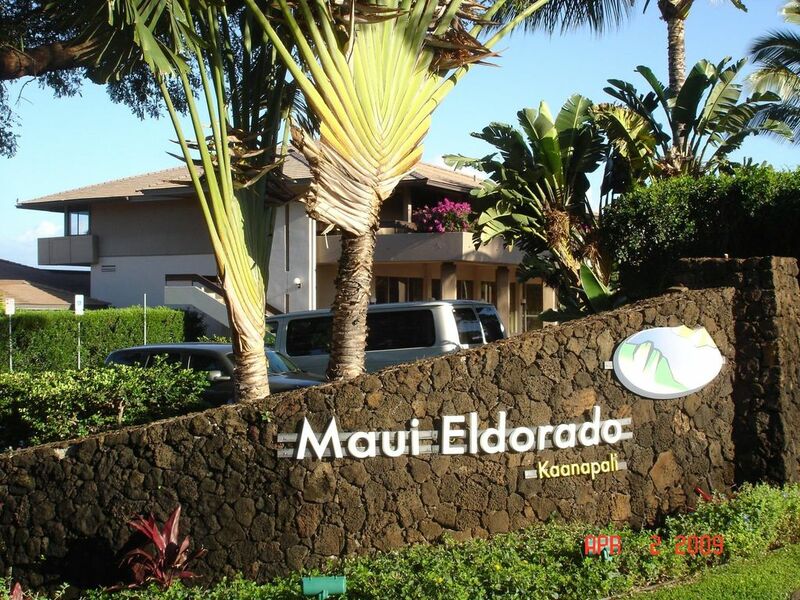 I'm having to move to another unit due to reservation conflicts and my extended work schedule and opted to stay at Maui Eldorado in another unit. The transition will be easy. I'll definitely look for this unit's availability when I return in a couple of years for work again! The condo is lovely in every way and by far the nicest property we've stayed at in our visits to Maui. It is well equipped with every convenience you could ask for (and some you didn't think of). The decor is beautiful - we felt like we were staying someone's home, and not a hotel property. Mike and Vicky are wonderful hosts, easy to communicate with, and we are grateful we had the chance to stay in their condo. Cannot wait to plan a future visit! Mahalo! So glad you and your husband had such a wonderful time in Maui and "our home away from home." We hope you are able to join us again for another trip to "our little corner of the world!" Wonderful property and location in Kaanapali! The newly renovated Whale pool is open and is a wonderful addition to the Resort. Great location in the heart of the Kaanapali Resort. The condo is newly updated and very comfortable. Many unexpected extras. You can tell the owner takes excellent care of the property. We thoroughly enjoyed our stay at this lovely 1 bedroom condo. I was especially impressed by the supplies in the kitchen. There was a great supply of herbs and spices, oil, vinegar, mustard etc. this saved me time for shopping and I enjoyed preparing several meals on our stay. Mike was a Responsive and informative owner...loved working with him. We will stay again...soon. Thank you, Wendy, for your stay at out Maui home. I am glad to have been able to quickly resolve the misunderstanding on fees, to both our satisfactions. As I write this, my wife is already packing for our upcoming visit over the holidays. We so look forward to returning home to Maui for another wonderful year of sun, sand, and surf! Thank you for your stay! We hope to see you again on another visit to our beautiful Maui. A hui ho ! (until we meet again). The condo and grounds were beautiful, but the ocean and beach were too far away. Our "ocean view" was a tiny wedge of blue in the distance. Also, the parking was inadequate - if you park in the garage, it's a steep walk up to the condo. And there was construction on the new pool right in front of our condo the entire stay. Thank you for your thoughtful review. The unit is advertised as having, “…a beautiful garden view and a partial ocean view of the channel separating the islands of Maui and Molakai.” There is a picture of this posted on the web site showing the garden and partial ocean view. The Front Desk is very accommodating. If you have trouble walking the short distance from the garage to the unit on a future stay,, they can provide parking nearer to the Lobby to avoid you having to walk up the slight hill from the garage. Bell cart service is available at most times if luggage or loads are heavy. We mentioned construction during the booking process. Unfortunately, Maui runs at its' own pace and schedules are likely to slip, as was the case. As of November 7th, 2016, the best estimate of the opening for the reconstructed pool in front of the unit is December 31, 2016. There are two other pools on the property that I hope you were able to utilize. One is located just outside the unit's back door and is shown in photographs on the web site. Of course, our beach cabana sitting directly on Kaanapali Beach is by far, a better alternative, and it can be accessed with the free Bell shuttle from the front desk. We hope you will return for another visit! Whale Watching (November-April); Hike Or Bike To The House Of The Sun, Haleakala Crater National Park; Snorkel In A Sunken Volcano; Attend A Native Luau & Learn The Hula; Drive & Picnic One Of The World's Most Scenic Routes, The Road to Hana; Swim In The Seven Sacred Pools Of Hana; Hike Through A Bamboo Forest And See Spectacular Waterfalls; Wind Surf At World Famous Hookipa Beach; Take A Horseback Ride On A Sandy Beach; Visit The Legendary Iao Valley Where Ancient Hawaiian Warriors Once Battled; Browse The Many Art Galleries And Shops In Old Lahaina Town; Dine Casually Or Elegantly On Maui's Famous Pacific Rim Cuisine; Shop Till You Drop, or Simply Relax On A Beach! Golf: This property is located on the Ka'anapali Golf Resort, home to the Royal Ka'anapali and Ka'anapali Kai golf courses. The Royal course is 6,693 yard course designed by Robert Trent Jones, Sr. The Kai course is 6,400 yard, par 70 course re-designed and renovated by Robin Nelson in 2009. Just 6 miles up the road is the Kapalua Golf Resort, home to the Plantation and Bay golf courses. The Plantation course hosts the PGA opening event each year in January. This Resort charges Guests a $60.00 check-in fee and $17/night Resort Guest Services & Parking fee upon arrival (effective January 1, 2019). This fee covers parking, towel service and attendant labor at the exclusive Beach Cabana, Bell Cart service to/from the beach Cabana, and Trolley Service to/from The Whalers Village Shopping Center and Kaanapali hotels. This fee is currently the least expensive in the Kaanapali Resort. Others charge as much as $30.00 per night. MY CELL PHONE CONTACT NUMBER IS 330-283-1727. CALL WITH ANY QUESTIONS.